My usual lunch routine involves nipping into the office canteen, which is run by Eurest and is quite outstanding for quality and variety for the subsidised price I pay; however a few days ago I ventured out to Apostrophe to try out their take on lunchtime eating. Apostrophe started out in Shoreditch, London in 2001 and has steadily grown to 23 outfits across the city and Heathrow and Gatwick airports since then. Apostrophe staff are trained to pay attention to detail from the fresh sandwich displays (we spotted on staff using a handheld vacuum cleaner to ensure the display was crumb free) to the freshness of the ingredients. I’ve popped into Apostrophe before, for a quick bite when working in the City, and remembered alluring colours of the freshly pressed juices, so when I walked into the Baker Street branch, this was the first thing I looked out for. This time the juices were behind me, so not immediately obvious, but the selection of sandwiches, soups and cakes and was just was impressive. Having been to the gym early in the morning, I could justify a larger lunch so I opted for the Reubens pastrami, Emmental, sauerkraut & mustard baguette (£3.95), chicken and seaweed broth (£4.25) and an apple and beetroot juice (£2.90). 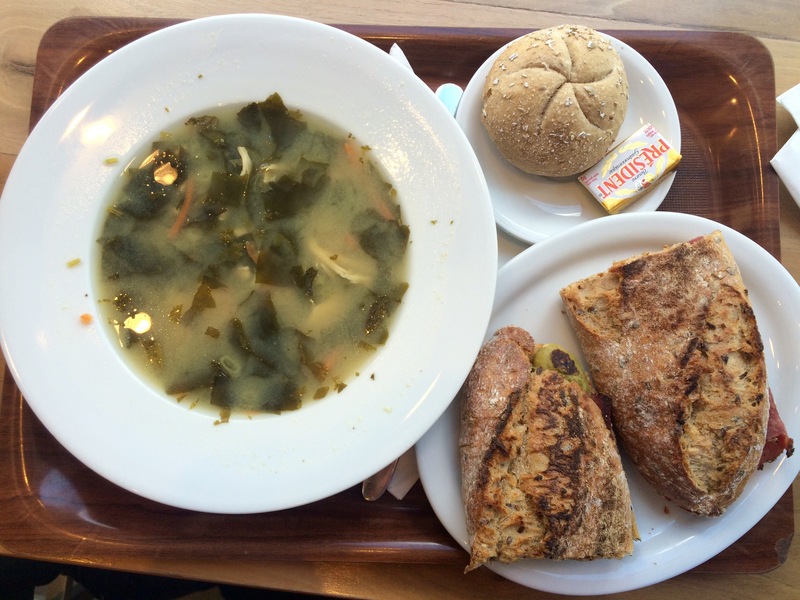 The broth, made with free range chicken and served with a wholemeal roll, was warming and nourishing, and although wouldn’t have been enough for me by itself, definitely set me on my way to get my energy levels back up to face the afternoon. The pastrami sandwich packed a punch of flavour – the combination of sauerkraut and mustard definitely woke my mouth up, banishing any hint of sluggishness from my body. The breads are all freshly baked and the quality of the ingredients was clear from the taste. I felt a sweet treat was also in order (well I had been to the gym after all), so chose the Rhubarb, strawberry and cinnamon cake (£2.30), which I drank with a Flat White (£2.45) and sparkling water (Hildon brand, priced at £1.30). 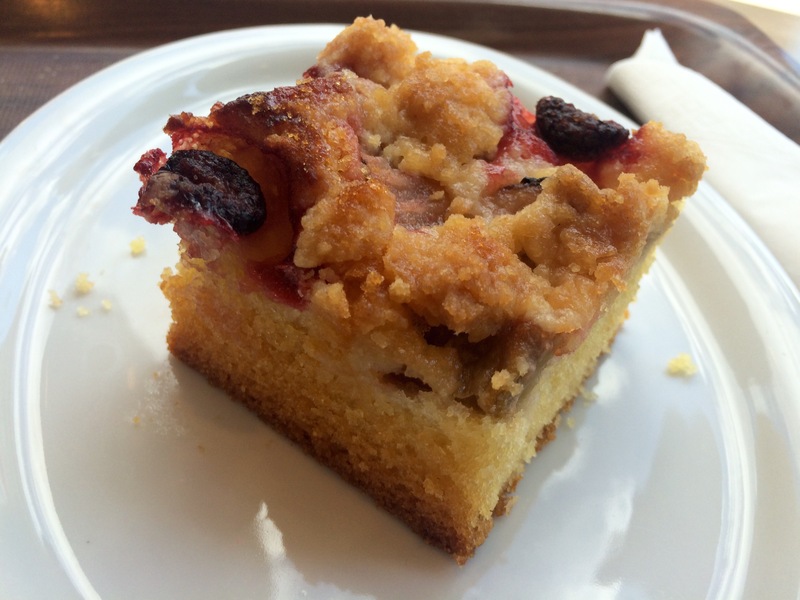 Although I couldn’t really taste the cinnamon flavour in the cake, the fruits in it were delicious and the sponge very moist and was very reminiscent of a recent recipe we tried here at Season’s Eatings: Rhubarb & Custard Traybake by Waitrose. Nunzia, the duty manager gave me a quick tour of the venue, showing me the different seating areas and also pointing out the complimentary flavoured waters (lemon and mint) for sit-in diners. She was also sure to make sure that I didn’t leave empty-handed (despite having eaten by now, more than enough for lunch), so I took a couple of muffins (rhubarb and walnut and triple chocolate flavours priced at £1.95 each) back for the girls in the office. Although these aren’t made in store, I’m told they’re freshly made at a central kitchen – reassuring to hear, given the recent article from the Independent about the tricks that the food industry uses to make ‘fresh’ foods last for weeks. Overall I was very impressed with the quality and flavours available at Apostrophe and glad to see that the apple and beetroot juice (the same pink colour as in the Apostrophe brand) are still on offer. The price points for the lunch items I bought were competitive for London and I would gladly pop back in for lunch again soon. The Baker Street branch of Apostrophe is located at, 19 Baker Street, London, W1U 8EQ and is open from 7:00 – 18:00 during the week (slightly short opening times at the weekend) for a delicious breakfast or lunch. For information on their other locations and menu options, visit them online at: http://www.apostropheuk.com.